As we begin another year, 2015 shows promising growth for the barefoot movement within the health & fitness industry. With an increase in barefoot-only training facilities, athletes prepping barefoot and even top educators touting the benefits of barefoot training we must remind ourselves – why barefoot?l And can these benefits exceed the athlete or the rehabbing client? Yes barefoot is more “natural’ but if we live in a shod society and spend out days pounding the pavement- do the benefits of barefoot training exceed the gym and training facility? I am faced with this question often as I continuously promote barefoot activation and barefoot rehab to my patients and in my education. I often ask myself – what is my ultimate goal by building this barefoot awareness? Will we all eventually opt for a barefoot lifestyle? Hardly. As we embrace this increased awareness towards the importance of feet, footwear, and barefoot training we must also remember that we live in a shod society, surrounded by a concrete jungle gym. How can we begin to apply the benefits of barefoot training beyond that of fitness, performance and rehab? The answer to this question has to do with the concept of movement efficiency. It is my goal to teach my patients how to restore their innate relationship with the ground on which they walk – thereby improving their ability to load and unload impact forces with each step. This natural ability to load and unload impact forces is referred to ask movement efficiency and really is my ultimate goal with my patients. By improving movement efficiency we decreased our risk of injury while optimizing our performance – both of which translates to enhancing our ability to do the things we enjoy to do. 1st – The human body was designed to move with the energy provided from impact forces. 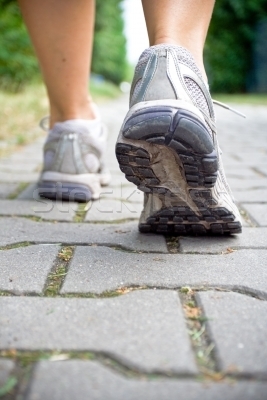 With each step we take the body encounters between 1 – 1.5 x our body weight in ground reaction forces. These impact forces are a necessary component to the energy we use take the next step. Acting as potential and elastic energy, proper loading and unloading of impact forces (energy) allows us to move with the grace of a dancer and the speed of an athlete. When we begin to lose this relationships with impact forces, movement which is often taken for granted (i.e. walking) becomes work. 2nd – The foot plays a critical role in how we respond to impact forces. It is actually pre-programmed into our nervous (and fascial) system to load / unload the energy – from the ground up. Starting with stimulation of the plantar foot, thousands of small mechanoceptors respond to the vibration created by impact forces. Stimulation of the plantar skin leads to a subsequent activation of the small muscles in the foot, which act as splints protecting the long bones of the foot (metatarsals). Directly following (or rather simultaneously) this intrinsic muscle contraction leads to co-activation of the proximal (hip) stabilizers which further controls deceleration and loading. A delay in the from the ground up loading mechanism is often associated with overuse injury such as shin splints Achilles tendonitis, patellofemoral pain, ITB syndrome plus more. All surfaces provide a certain frequency of vibrations (impact forces) when contacted by the foot. With the optimal frequency lying within 15 – 20 Hz our neuromuscular system is designed to create a reflexive response to this input. Remembering that vibrations provide the energy we need to take the next step, our ability to match this ideal frequency is important. Certain surfaces such as concrete or marble do not transmit vibrations well. Impact on these unnatural surfaces still in present but instead of it transmitting through the surface and the body – all of the forces transmit proximally through the body. These increase in impact forces alters the vibration frequency and thereby alters the timing of the loading response. The more we continue to alter the input encountered by the body, the greater the risk of injury with the most common being stress fractures. Not only does today’s society require movement on unforgiving, unnatural surfaces but it must also be done in shoes. Footwear blocks our perception of impact force vibration frequency, creating a complete disassociation from the ground on which we walk. If we do not continuously tap into our innate loading response and plantar foot stimulation, we are setting ourselves up for continued risk of injury. I have build a program which I teach my patients how to keep the plantar foot strong and neuromuscular responses sharp. I call this the BarefootRx Program. 1. Keep the feet strong. 18 muscles in the bottom of the foot designed to contract against the impact forces of each step. My go-to exercise for foot strengthening is short foot. If short foot is not your cup of tea simply balance on one leg (barefoot) will begin to activate the intrinsics of the foot. 2. Keep the feet flexible. To have flexible feet means that you are allowing the foot to dance between laoding and unloading with each step we take. Note that flexible does not mean unstable, so having a flat foot isn’t an advantage in this concept. My go-to exercise for flexible feet is to stand on golf balls or a lacrosse ball. There are a variety of products now on the market which are designed for plantar foot release. I am not partial to any as long as you are releasing your foot. 3. Foot to core integration. Since the body (and our loading response) is integrated between the foot and proximal core / hip integration is key to optimal movement efficiency. Here barefoot balancing is my go-to exercise. Through progressive barefoot balance exercises with short foot one is able to restore and promote foot to core stabilizing patterns. As a Podiatrist one of the most common conditions we treat is heel pain. Whether it be Achilles tendonitis or plantar fasciitis the success of patient recovery is highly dependent on the duration of their symptoms and the health of the connective tissue associated. Although I wish every patient presented to my office at the initial onset of symptoms unfortunately this is usually not the case. The average patient often presents after experiencing heel pain for 3 months, 6 months or sometimes over a year. The patient may have tried the occasional over the counter insert, a little stretching and maybe even icing, however their lack of consistency has provided little relief. So now they have turned to me to give them that quick fix, immediate relief in one visit. It’s time to break the news to them that this is not possible…. One of the biggest misconceptions among patients (and I’d have to argue also among professionals) is regarding how connective tissue gets injured and the consideration of collagen health in soft tissue injury. You can correct the muscle imbalances and movement patterns however attention must still be directed at the injuries connective tissue and collagen structure. We are going to focus primarily on the connective tissue of the foot as it is uniquely associated with a majority of impact forces during closed chain movements. With each step we take 1 -1.5 x our body weight in impact forces is entering the foot / body. Perceived as vibrations which are damped (absorbed) through isometric contractions, these impact forces are stored as potential energy in our connective tissue (tendons, fascia). To properly absorb and store impact forces as energy our connective tissue must be under a state of tension and have a certain degree of elasticity. I often associated our connective tissue to a rubber band. When we load impact forces and store them as potential energy this would be equivalent to stretching the rubber band. Now what happens when we do not have tensile stiffness and elasticity this would be analogous to a dried out rubber band. When you load the rubber band by pulling it you eventually reach a “fatigue point” and the rubber band breaks. This is analogous to our connective tissue micro-tearing at a certain fatigue point. Micro-tears in fitness is often associated with the overload principle, strength gains and muscle hypertrophy. When we strength train (especially when doing eccentrics) we micro-tear the muscle fibers which are repaired created larger muscle fibers. All positives. However with connective tissue it’s not so positive. In connective tissue (tendons / fascia) when there is not enough elasticity in the tissue, micro-tears occur. These connective tissue micro-tears are repaired with a different type of collagen than what the connective tissue is primarily composed of (Type III vs. Type I). Type III collagen is stiffer and less elastic then Type I collagen, and is laid down in a haphazard manner. In addition, all micro-tears whether it be in muscle or connective tissue is associated with inflammation. Persistent inflammation around connective tissue whether it be bone or tendon creates thinning of tissue. This micro-tear, inflammatory cycle which begins as an acute stress to the tissue now becomes a perpetual cycle and we start to hit a road block in the tissue repair process. The longer the patient’s connective tissue sits in this micro-tear / inflammatory cycle the more the tissue begins to change composition and the harder it is to establish any long lasting pain relief. Enter chronic heel pain. These are the patients who do not respond to just muscle balancing and corrective exercise. So what can this patient with chronic connective tissue pain do? In connective tissue health, if we are in a chronic state my goal is to drop the patient’s inflammation as quickly as possible. Although corticosteroid injections are of great debate with conflicting research, I have seen the greatest and fastest results when I incorporate them into my patient recovery (especially in the acute patient). I am quick to give injections in my acute patients to get them out of this inflammatory cycle and have had great success with this approach. Being able to drop the inflammatory process and allow the tissue to move forward in the repair process is a necessary step. If you are not in the acute state > 6 months then the above options may not be as effective. The longer the chronic state of tissue injury the harder it is to bring it back to it’s youthful state. In the patient that is not responding to inflammatory treatment and is in the chronic state then we need to consider options to get the connective tissue back to it’s pre-injury state. procedures such as Tenex and Topaz. The way that the above procedures work is by creating fresh tissue injury and restarting the inflammatory / injury cascade. The above procedures must be followed by limited activity / immobilization and no NSAIDs can be taken as in this case the inflammation is good. Once the connective tissue state is dropped down to a non-inflaammatory state (acute) or re-injured / inflamed (chronic) then it is time to start focusing on the stress that is being placed on the connective tissue. At this same time all patients are assessed for biomechanical imbalances, compensation patterns and movement dysfunction which is driving the faulty loading of the connective tissue. During this part of the recovery process I am often incorporating the barefoot science of BarefootRx and emphasize the importance of how the body is designed to load / unload impact forces and react to movement – from the ground up! The next time you have a patient or client with heel pain, or really any connective tissue injury consider the duration of symptoms, state of the connective tissue and stress being placed on the tissue. All to often I see a patient addressing only inflammation, and not the stress being placed on the tissue or vice versa. Both must be considered to for the most successful patient recovery.